I had climbed Clouds Rest in a one day round trip from home (about a 200 mile drive each way) once with a companion who wanted the peak. We led official Sierra Club hikes in Yosemite Valley, also, in one day from town. We even had plenty of time to visit the Village, and also quickly see the main sights. The catch to these were that the meeting times had to be early. 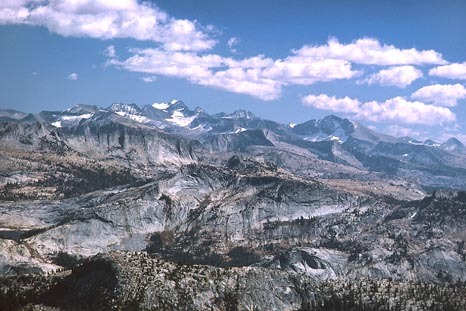 The reason for these day outings was, initially, that hikers complained that they "didn't have the time for Yosemite!" So, instead of a weekend trip or longer, we would do a hike or a peak in about the same time as for any other regular ambitious hike. I had discovered an easy, class 2 route up Tuolumne Peak last year, when I was curious why the climbers guide didn't list anything below class 5 up this summit. So, with the ambitious plans of the Climbing-Knapsack Section, I met the group at about 6 a.m.
People are reluctant to do the driving, just from an economic end. The suggested local chapter rates for sharing carpooling expenses grossly benefit the passenger. The driver was always expected to be extremely generous, as I often am. I love to climb, hike, and ski, and the more the merrier, for me. So, I took two while other cars took some of the others. Two others I gave the directions to the trailhead meeting place. There is a sort of shortcut to the park, through county roads, bypassing Escalon on Highway 120. I regard this to save 10 or 15 minutes. Here they are: Traveling south on U.S. 99, take the Mariposa Road Exit in Stockton, then head east on J7 for about 20 miles, making stops at a few intersections. The road swings right, then quickly comes to a stop at Lone Tree Road. Turn left, passing three farm silos here. Stopping at more intersections, pass through the little community of Valley Home, then turn right as the road ends. Continue several miles to Highway 120, where one turns left, then, into Oakdale. Caution: In the winter, this route does flood during heavy rain. This route is hard to explain while organizing the group, so I advised the one carpool of two to simply take CA 120 east at Manteca, CA. My car went quickly to the McDonald's in Oakdale, CA, for a favorite stop. Taking about fifteen minutes here, we allow time for coffee and a rest break. The signs of Highway 120 lead the way to Yosemite National Park, and we came to our trailhead, at May Lake, by 10 a.m. The carpool of two failed to show up. I waited till 10:25 a.m., when we had to start. I left a note on my car instructing them not to try to follow, since the route is not obvious. There are too many lost hikers in Yosemite to risk their independent navigation effort, and I had allowed plenty of time for their drive. I led the group of six along the trail to May Lake, then right toward a roundabout way to Ten Lakes. A faint, unsigned footpath diverges from the main trail. This leads to the base of Tuolumne Peak. The class 2 route is obvious, assuming one knows where they are. Some local chapter leaders don't do very well on navigation, habitually doing the same hike each year by memory. A new area is seen to confuse many hikers. Training requires a solid math background. Map work is easy for me, since I have been reading them since I was in elementary school. Not that it makes a big difference, but I studied under the world's greatest topologist while off at UCB. We left the footpath and climbed cross-country to the top. This isn't a real hard climb. The views are spectacular. Mt. Hoffman, two miles to the southwest, has a trail most of the way to the top. Mt. Hoffman was recommended, by John Muir himself, as the best view of the park for a visitor with little time. I feel that Tuolumne Peak has a slightly better view to the north, and east. We had lunch, and enjoyed more views, all ways. The Valley was smoked in a bit, probably from some fire. The air up here was very clear, and there was time for some to explore about the summit area. Finally, it was time to go back, and as we came back to the trailhead, the missing carpool of two appeared. They were delayed by rest stops, and inability to expediently motor up Highway 120. They said they pulled in five minutes after we started. I'd normally love to invite them on another peak climb, but after a real problem with one of them getting lost, previously, on another easy peak, I felt I should decline that. On that trip, a rear leader directive was ignored. Then, a worrisome search and rescue by the group was made necessary. If you don't know the way, don't leave the group! The drive home along Highway 120 was graced by plenty of fall color. There was golden aspen, big yellow leaves, bright red dogwood, and even grasses turned to straw colors! 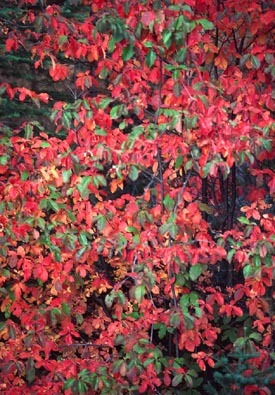 There is a good pullout with a big stand of dogwood several miles down from the entrance station. The time of the change varies from year to year. Also, the quality differs, with leaves drying up and falling off, without much to see, in some years. We enjoyed a red ball sunset descending Priest Grade, and were back home, even, at a decent hour. One hiker was making this peak after a turn-around last year. A good hearted leader will help participants to the top. We regard it as important to complete a climb, for our list checkoffs. While some people will make a weak attempt, then curse it all and turn around, we were then, an older Sierra Club. One purpose is to teach appreciation of the wilderness, and bring people to views worth saving for eternity. Outdoor skills are also passed along, as allowed by outings regulations, now. A fall peak climb I especially savor, for I know, then, that I have made it through another peak climbing year. We have our many successes to reflect back on, and hopefully a great, upcoming snow year for ski touring and ski mountaineering. The winter brings social opportunities, and now, for me, the prospect of desert trips. With my official, local chapter, peak climbs soon coming to a mandated close, I would miss the camaraderie and company of, generally, such civil and capable persons. Some of us still keep in touch, but for most, official peak climbing has gone with the wind, locally. As we all age, interest shifts, and the chapter dictums certainly blew all this away. Parties, dances, and volleyball were made the main activities. That all perhaps lessens whatever impact on our beloved mountains!